Impress your guests with these elegant individual trifles - just don't tell them how easy they are to make! This recipe is a great way to make the most of seasonal fresh cranberries, from Massachusetts in America, which combine really well with the flavours of almond and orange. Place the cranberries in a small pan with the orange juice. Bring to the boil, then simmer uncovered for 5 minutes. Stir in the sugar and simmer for a further 10 minutes until the cranberries are tender. Leave to cool. Roughly break up the biscuits, reserve a few pieces for the topping and divide the remainder between 6 large wine or sundae glasses. Reserve 2 tablespoons of the cooked cranberries, then spoon the remainder over the biscuits. 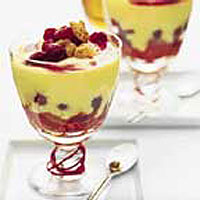 Pour over the custard, then decorate each trifle with Cointreau cream. Top with the reserved cranberries and biscuits. Serve straight away or chill until required. You can make these trifles up to 8 hours ahead and chill in the fridge until ready to serve.